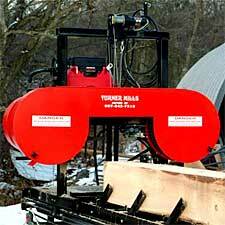 The Turner Hydraulic Mill offers the best of sawing ease utilizing hydraulic power to do all the work for you. 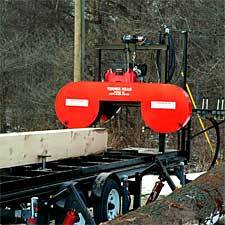 The Trailer Model features include a 20' track and a 22" high saw deck which eases log loading. All operator functions are made from one side of the mill, with the sawdust exiting the opposite side, making a cleaner, more productive workspace. Down to earth sawing at its best. A 20' track and a wide variety of power plants makes the Ground Model very popular and easy to use. 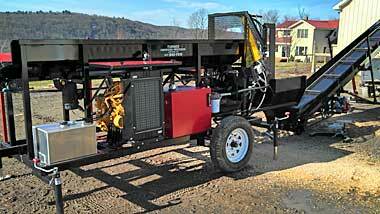 << Shown here is the Turner Mills Firewood Processor. 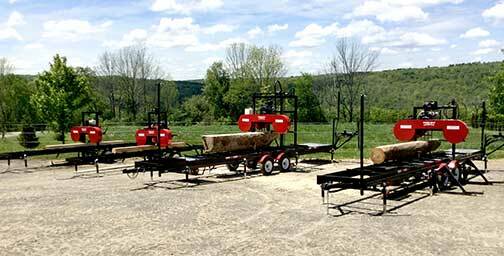 After owning and not being satisfied with other portable sawmills in years past, I decided to design a reliable, portable band saw mill that would be rugged enough to withstand my everyday use. 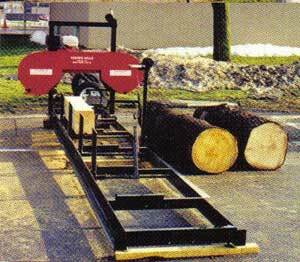 You can see for yourself the simplicity, durability and creativity of my portable sawmill design. Ease of use and affordability was a priority without jeopardizing durability. My goal was to give the customer what he needs to do the job, such as a 20’ track, 4 log clamps and stops, double roller blade guides, and a saw head rugged enough to accommodate a 9 through 24 HP engine with locally available parts and most of all, eliminating band blade breakage. Our options retrofit all of our band mills making it easy and affordable to upgrade. I personally build each saw head, testing and fine-tuning them to assure the best quality and performance. For 14 years we have been designing and manufacturing band sawmills that will provide the customer with the highest available return on investment.